Cynthia just stood there on the porch, leaning against the wall between the door and the window. She was shocked when she overheard John saying that he didn't want to get married. He was so brave with her, he seemed to already look forward to be a father, concerned for the two of them. Her eyes welled up in tears because she didn't realize the truth and now it's staring right in her face. To be honest, she wasn't ready either, to be a wife or a mother. She left Liverpool College of Art and her dream career as an art teacher to settle down to be the wife and mother. She looked down at her stomach and put her hand there, thoughts were zooming around her head, what should I do? Abortions were quietly known but illegal and she has no desire to kill her baby. There was adoption, but she already loves her unborn baby enough not to give it up. She turned and walked off, her taxi was waiting for her. She needed time to think, but there was not much time left. Her big day was tomorrow. She decided to open up her mind and divided her thoughts to think more clearly. 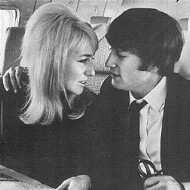 They are getting married mainly to protect the baby, they did love each other deeply and John has said to her and to his friends that he was planning to marry her as soon as the Beatles took off and things have settled. However, there's some negative theories. If and when the Beatles do take off, they will tour constantly and rarely come back home, there's even a big consideration that they may base their home in London. Also to add, countless attractive girls will throw themselves at them. That was really why Paul and Dot broke up. The main thing that crossed Cynthia's mind was that she and John were the only couple that lasted longer than the others. They went through separations with a tour in Scotland and their experience in Hamburg, Germany. John had always held Cynthia as his main gal. Whether they get married or not, they are bound to be separated even more and longer and Cynthia will be stuck with the baby. When Cynthia arrived at her flat, she already made her decision. She decided not to get married to John after all. She loves him too much to let him go and be with his main love: his music. She knew she couldn't compete with music. John had his heart set on music longer than they even met. She was going to move out of her flat and into Phyl's, and once she makes reservations for a boat and all packed, she was to move to Canada to live with her mother and have her help her baby. It's the only way and easier way to let John go. She didn't bother going to bed that night, instead, she gathered up all the boxes and packed up her possessions and clothes. She knew that Brian is sending a car over to collect her to take her to Mount Pleasant Registry Office. She decided that she'll stay in and pretend not to be home when the driver knocks, when she's sure that he's gone, she'll make her move to Phyl's. In the early hours in the morning, when she knew that it was time to call Phyl and tell her what's going to happen, she called. Phyl listened to Cynthia and reassured her that she can move in right away and help her leave England for Canada. After she hung up, she heard the knock on the door. It was the driver. "Miss Powell? Are you ready? Miss Powell?" called the driver, who knocked. Cynthia kept quiet. After a few more tries, the driver finally gave up and left. Cynthia carefully looked out at the window and watched him drive away. It was time to make her escape. Phyl came in just in time to help Cynthia carry her things into her new car that she got recently. Phyl looked very concern but was very quiet. Through Cynthia's tears this morning, she understood her, after all, they've been friends since grammar school. When they got to Phyl's home, they unloaded Cynthia's belongings. Cynthia told Phyl that if John came by or called looking for her, tell him that she's not here...or anywhere for that matter. Phyl nodded and respected Cynthia's wishes. Phyl suggested to Cynthia to take a nap for the sake of the baby. Cynthia obeyed; she was really tired from the night she had. Meanwhile, the driver arrived at the registry office and went into the library, not sure what to say to the party. John, Brian, George, Paul, Tony, and his wife Margery were already there and waiting. "Where's Cyn?" John asked. "She wasn't there," the driver explained. "What do you mean 'she wasn't there', of course she's there!" exclaimed John, who was starting to get worried. "Now, now John, calm down," Brian told John, he then turned to the driver, "what happen?". The driver took a deep breath and then explained that he went over to Garmoyle Road to collect Miss Powell and knocked on her door several times, even trying to call out her name, but there was no answer. Brian nodded and looked a bit worried. He then turned to John, "do you recall her saying that she's going to spend the night somewhere or anything?". John shook his head. Tony went over to where John, Brian, and the driver was and asked what was going on and why hasn't his sister arrived yet. John stormed out of the registry office and Brian explained to Tony what was going on. Paul and George followed John outside the registry office to see what they can do. "How could she do this? How could she do this to me and to the baby?" John kept asking. "Well, maybe something happened," said Paul. "Like what?" asked John, turning to Paul with an icy glare. "Well," Paul gulped, trying to think of a reasonable excuse, "maybe she got the wedding jitters or something terrible has happened?" "You know, maybe you're right, I mean, what if she's in the hospital? What if something happen to the baby?" John started to panic. Brian came out and heard in time of the possibility that Cynthia may be at the hospital. Brian told John that he'll borrow the registry's phone and call the hospitals to see if any patient have been brought in for the last twenty four hours. After a couple minutes, no hospital has a patient name Cynthia Powell. "That's it," said John, angrily, "I'm going over to Cynthia's and see what is going on!" with that, John turned his heal and stormed off. Tony and Margery asked Brian to contact them if any news about Cynthia's whereabouts and Brian nodded. "This, I got up for nothing!" Paul muttered, who wasn't exactly thrilled that he had to get up pretty early. Paul decided to go back home by bus and George followed. Brian decided to go to his office and call around to see if they have seen Cynthia.